Named in the top 10 apartments in North Carolina for online ratings/reviews! Take a tour to experience our customer service for yourself. Located in South End, and neighboring Uptown Charlotte, Camden Southline offers studio, one, and two bedroom apartment homes with luxury finishes like stainless steel appliances, quartz countertops and upgraded cabinets. Just steps from your apartment you’ll enjoy the local flavor of unique dining and entertainment hotspots like Atherton Mills and Farmers Market. No need for a car when you want to explore! Our apartments are within walking distance to the New Bern and East/West Light Rail stations making it easy to get to Bank of America Stadium, BB&T Ballpark and Spectrum Center. When it’s time to stay in, you won’t be disappointed! Camden Southline offers incredible amenities like a saltwater pool, on-site fitness center with virtual trainer and yoga zone, as well as a bike workshop. Your apartment also includes conveniences like full-size washers and dryers. 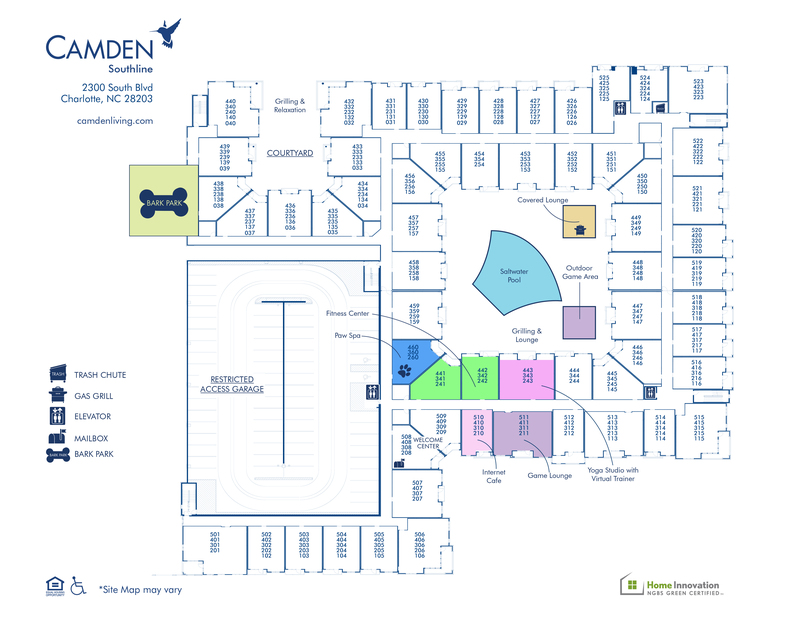 Camden Southline is pet-friendly featuring a Paw Spa and unleashed Bark Park with large greenspace, walking path and benches. We’ve thought of it all so you don’t have to! Come home to Camden Southline today. At Camden, your pets are family too! We welcome cats and dogs. We'll save a spot for you! We offer up one parking space per Lease Holder in our parking garage for $10 monthly. Additional reserved spaces are $40 per space, per month. Contact Leasing Office for details.. Visitor Parking is designated on the 6th floor of the gated covered parking deck. Storage for apartment homes is also available and range anywhere from $25-$100 per month.